Sharing the road with commercial trucks can be intimidating. After all, the enormous rigs weigh several tons, and that much weight traveling at high speeds has massive destruction potential. Although you may feel worried around large trucks on the highway, you can pass them without worry if you follow the four tips listed below. Truck drivers will be grateful for your driving expertise and for helping them stay safe, too. Even if you just want to get away from a slow-moving truck, trying to pass it at the wrong time can create an even more stressful and dangerous situation. Clearly, if you’re following a commercial truck on a two-lane road, do not attempt to pass it unless you have the dotted yellow line. Remember that passing a truck and trailer will require more space than a smaller vehicle, so don’t attempt to pass near a curve in the road or on a hill. Finally, on both highways and two-way roads, avoid passing trucks on a downhill slope. Big trucks tend to pick up momentum, so let the truck stay in front as it gathers speed to avoid an accident. Once you’ve determined it is safe to pass a commercial truck, you need to make the truck driver aware of your intentions. Confirm that you can see the truck driver in the side view mirror, then turn on your turn signal. After a moment, you can then move into the passing lane. Before you pass a truck, and while passing, remain aware of the truck driver’s blind spots. Unlike cars with rear-view mirrors, big rig drivers cannot see directly behind the trailer. Truck drivers also cannot see vehicles on either side of the truck once the car can no longer be seen in the side-view mirror. Pass promptly and do not linger in blind areas to avoid an accident. Once you’ve cleared the truck, remain in the passing lane for longer than you would when passing a car. Commercial trucks take longer to slow down and stop due to their higher inertia, so leave plenty of space in front of the truck to avoid an accident. Make sure you can see the truck’s entire windshield in your rear view mirror before returning to the right lane. Once you’re past the truck, don’t hang around. Avoid speeding, but try to continue moving away from the truck. 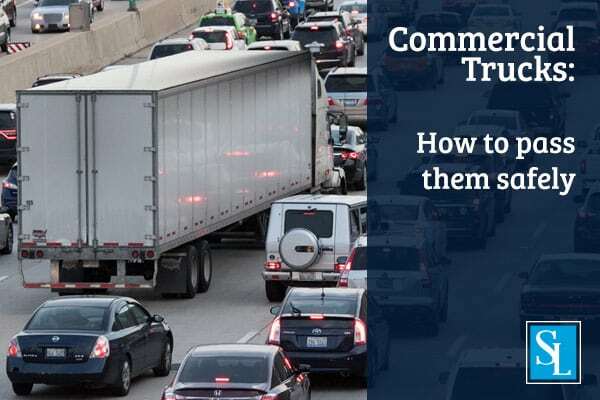 Although these tips for safely passing commercial trucks can help avoid an accident, there are other factors that can increase your chance of being involved in a vehicle accident. Of all car-crash related deaths, 32% are from drunk driving, 31% are from speeding, 16% are from distraction, and 11% are from weather. When commercial trucks are involved, these types of accidents can become even more devastating. If you have been involved in an accident with a commercial truck, contact the Steigmann Law team today.